Sale is for Marie Antoinette Parade Characters ONLY. 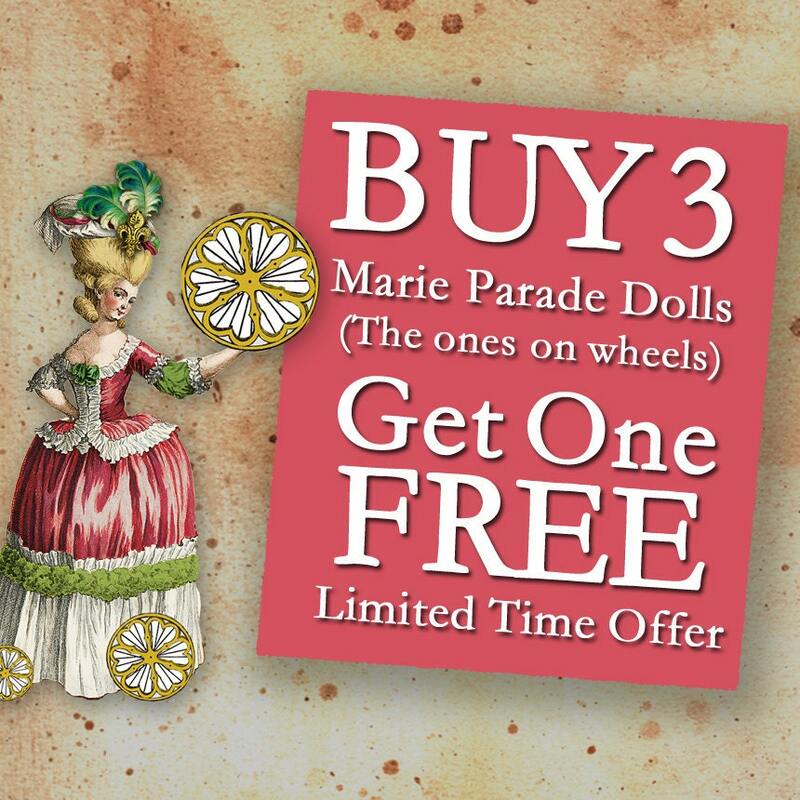 Look for the Marie dolls with the golden wheels. They are the ones on sale. See photos here of some of the sale items. (They are not the only items on sale., just as sampling.) Use them as party decorations, table centerpieces, or as unique 3D greeting cards. The images will work in with your scrapbooking and mixed media projects, too. 1. Choose from Style Numbers MA2 thru MA17. Style numbers are written at the end of each listing headline. See the individual doll descriptions and lots of photos in my Marie Antoinette section. Or to find a particular style number, type the number in my shop search box. 2. Enter the four style numbers that you want to buy in NOTES TO SELLER when ordering. Or you can copy the URL of the listing for each item and paste it in Notes To Seller. 3. Submit your order and pay the $18. (the regular cost for three dolls). 4. I will ship your order within 48 hours ( usually next morning) via the email address you have on file with etsy. If you don't receive your files within 48 hours, check your SPAM before contacting me. BUYER NOTES: See my policies for information on digital downloads. Files will come ZIPPED (compressed) jpgs unless you tell me in Notes To Seller that you want UNZIPPED. If you only have Microsoft Word, ask for pdf format in the Notes To Seller when ordering. Be sure to empty your mailbox immediately after ordering so there is enough memory to receive my files. If you don't receive your files within 48 hours, check your SPAM before contacting me. My digital files are not for resale. You cannot sell printed copies of the files. No mass production. Do not give to your friends. Have them come here and buy their own copies. See policies for more info. I ship to the US only, except for digital downloads which can ship anywhere via email. You will receive my email within 48 hrs (usually next morning) after your payment clears. If you don't get it by then, check you email SPAM before contacting me. Not responsible for shipping errors (lost or damaged, etc. ), therefore insurance is strongly suggested. If the shipping cost is $1.00 or more over what I charged you, I will send you a refund for that amount.